I volunteer as an advocate for survivors of domestic violence. Our agency’s new initiative this year was to raise awareness on teen dating violence, so I am well versed in the dynamics of these kind of relationships. 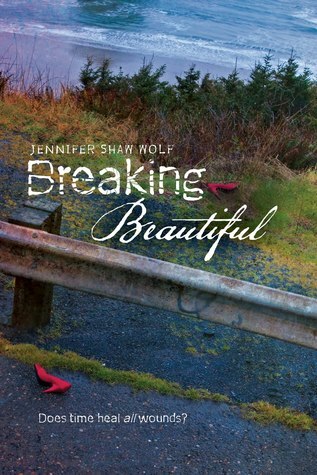 Jennifer Shaw Wolf has done a fantastic job portraying an abusive teen relationship in a very realistic manner in Breaking Beautiful. Trip is the boy who could do no wrong. Handsome, athletic, popular, and his parents are the powerful players in their small seaside town. When Allie movies permanently to the town her mother grew up in and that where she spent summers with her grandmother, she’s flattered to be his boyfriend. But as the story unfolds, we realize that they are not the perfect couple, and now that Trip has died in a car accident that Allie can’t remember, she can’t tell anyone about the abuse she experienced. The town, and particularly Trip’s father, begin to suspect Allie of foul play. Not only is this story an accurate portrayal of an abusive relationship, it’s a well-plotted (if not exactly surprising, in the end) mystery. Trip slowly isolates Allie away from her friends and family and seeks to gain control over her. He hits her, but not where people can see and always apologizes afterward, showering her with cards and gifts. He doesn’t see his treatment as wrong because he has a sense of masculine entitlement. Classic abuse. Not only has Wolf done a great job at portraying abuse, I’m also happy to see a character who has a challenging disability but is still well-rounded and not a caricature. Allie’s twin brother Andrew has cerebral palsy. He’s an integral part of the story and not relegated to the sidelines. It’s hard to be in the head of an abuse victim, but I thought Wolf captures Allie perfectly and though it’s rough for a while, we see her grow and change. I sympathized with her very much. It’s easy to wonder about abuse victims “why do they stay?” but Allie’s internal thoughts give us a glimpse into the mind of someone who has been continually knocked down by an abusive partner. While I’m sure this happens all the time, I was particularly saddened by how distant Allie was from her parents and how blind they were to her obvious symptoms of emotional and physical abuse. Parents (and others who have a lot of interaction with young adults), pay attention to what they aren’t saying, not just what they reveal! Though in the end, I had the plot lined figured out half way through and wasn’t that surprised by the ending, it was still an enjoyable and emotional read. We are all beautifully broken, and despite the trauma that Allie has endured, in the end, I feel hopeful for her. I recommend this book to fans of contemporary young adult literature with a hint of mystery and romance and to anyone wanting to gain insight into survivors of teen dating violence (and particularly those who work with teens). I did like this book but I had the same reservations about the parents as you did. My main problem with the book was all the the adults, even people in the school. Their reaction to things really put me off the book as a whole. Yes, the adults did seem to be rather malicious. But I didn’t think that it was unrealistic. I was appalled by their behavior, but it didn’t ruin the book for me. Wow! Sounds like a real emotional trip. I think these books really can be thought provoking and it’s great to see it done in such a sensitive manner (by the sounds of things). I think I’ll definitely have to pick this book up and I’m sure I’ll end up crying. It’s emotional, but it wasn’t a big cry-fest for me. It was worth my time reading it…which I can’t say for every book. Ahhh, I cry whenever I’m emotional. I think it’s refreshing to have a book like that!